Establishment of a correct diagnosis is crucial for the institution of adequate therapy. However, the diagnosis of pulpal, periapical, and periodontal conditions sometimes lacks precision, especially because their analysis is based on the use of various clinical and image resources. 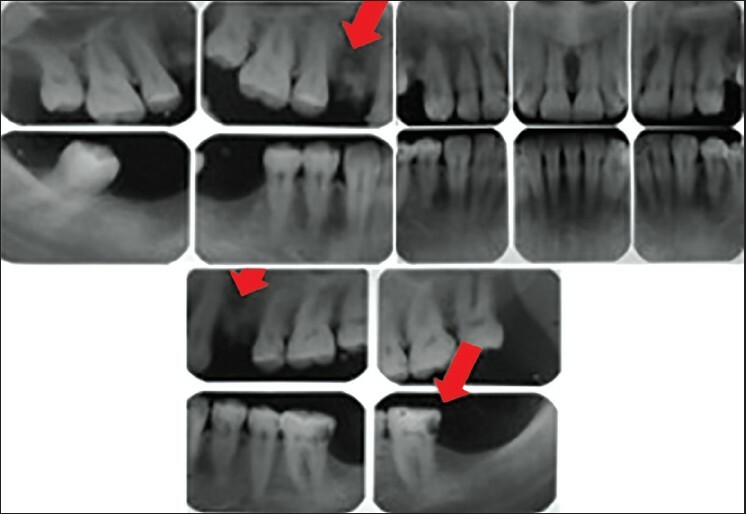 Several authors have reported that the detection of periradicular lesions based on dental imaging techniques routinely used in clinical practice (namely, radiography) occurs only at a late or advanced stage of infection. ,, This limitation causes delays in treatment initiation and consequently worsens the severity of tissue damage, leading to a less favorable prognosis. 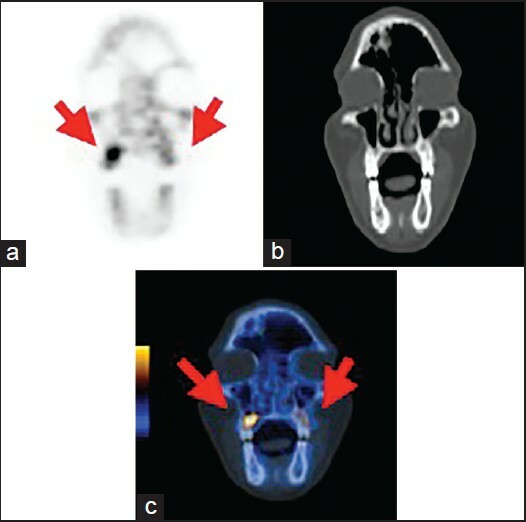 Positron emission tomography/computed tomography (PET/CT) is a nuclear medicine technique in which a radioactive tracer is administered to the patient and collects in a given organ or tissue, remaining there for a long enough time period to allow detection by specific equipment that produces tracer distribution images. PET scanners can be used alone or in association with conventional CT scanners (then named multi-slice spiral scanners), allowing morphological (CT) and metabolic (PET) images to be simultaneously obtained. The objective of this study was to compare diagnostic data obtained with 18 F-NaF PET/CT and conventional radiographic imaging techniques (periapical/parallelism technique and panoramic radiographs) in the detection of periradicular lesions. The study protocol was approved by the Research Ethics Committee of the institution where the study was carried out (protocol no. 041/10 CEP/ICS/Universidade Paulista). A total of 256 maxillary and mandibular areas (1 area/tooth) of eight patients (four males and four females) schedule for the PET/CT exam were selected for analysis. Patient age ranged from 27 to 48 years. After anamnesis and clinical examination, patients were submitted to radiographic examination as follows: Panoramic radiographs (HF100 X-ray machine, 70 kV, Dabi Atlante, Ribeirão Preto, Brazil) and periapical radiographs (Dabi Spectro 70× Eletronic, 70 kV, Ribeirão Preto, Brazil) using the paralleling technique. Insight radiographic films were used (Eastman Kodak Co., Rochester, USA) combined with Hanshin intraoral film-holders (Jon, São Paulo, Brazil) and a lead apron for gonadal and thyroid protection. [Table 1] shows the verification of image and clinical findings, describing positive and negative findings in each patient. Subsequently, patients were also submitted to 18 F-NaF PET/CT (Discovery ST, GE Medical Systems, Milwaukee, WI, USA). All patients signed an informed consent form prior to administration of the imaging agent and inclusion in the study. 18 F-NaF PET/CT image acquisition was performed at the Service of Nuclear Medicine at Hospital Israelita Albert Einstein, São Paulo, Brazil. First, 18 F-NaF was administered intravenously at a dose of 370 MBq (dose calculated based on the weight of an adult, approximately 70 kg). Images were collected 30 min after tracer administration. The protocol included images from the top of the head to the middle third of the neck region, with the patient lying in the supine position and the arms resting at the sides. CT section thickness was 1.25 mm. Patients were immobilized using a head support specifically designed to prevent movement of the area under analysis and consequently image distortion. In order to maintain an uniform parallel position between maxillary and mandibular arches, patients were instructed to hold an insulin/hypodermic syringe with their anterior teeth (Injecta, Belo Horizonte, Brazil). All PET/CT images were analyzed by one nuclear physician and one endodontist with expertise in the method. All images showing hot spots in the dental areas selected for analysis were considered to be positive. Possible inflammatory/infectious disease processes were quantified using the standard uptake value as a semiquantitative criterion. Following image analysis, results were statistically analyzed and expressed as absolute numbers and percentages of positive images. The number of positive images obtained with each of the three methods (periapical vs. panoramic radiography, and radiography vs. PET/CT) was compared using ANOVA (P ≤ 0.05). [Table 2] shows the results obtained with the maxillary and mandibular areas analyzed in relation to the presence of images suggestive of periradicular lesions. The number of positive findings obtained with PET/CT was significantly higher when compared with the two radiographic methods assessed (ANOVA, P = 0.05). In turn, no significant differences were observed between the two radiographic imaging techniques employed (panoramic and periapical) [Table 1] and [Table 3]. [Figure 1], [Figure 2], [Figure 3], [Figure 4], [Figure 5] shows image suggestive of periradicular lesions in patient number 6. Subsequent clinical examination of the teeth confirmed the presence of two periradicular lesions caused by residual roots in the maxilla and caries in the distal surface of the lower left first molar. Accurate diagnosis of dental conditions in general and of endodontic conditions in particular requires the greatest possible amount of data available, collected during clinical examination like the thermical, electrical, percussion and palpation tests or via supplementary tests following anamnesis. Once all signs and symptoms have been identified and analyzed, it will be possible to determine the most adequate therapy for the condition found in each case. Radiographic underestimation of loss of bone tissue when compared with data collected clinically. Braz et al. and Fonse Ca et al. have recommended the use of CT (rather than two-dimensional radiographic techniques) for three-dimensional analysis of the human pulp-dentin complex and other structures of the oral cavity. However, CT techniques are also dependent on static exams, which require changes to the tooth structure for the detection of abnormalities. 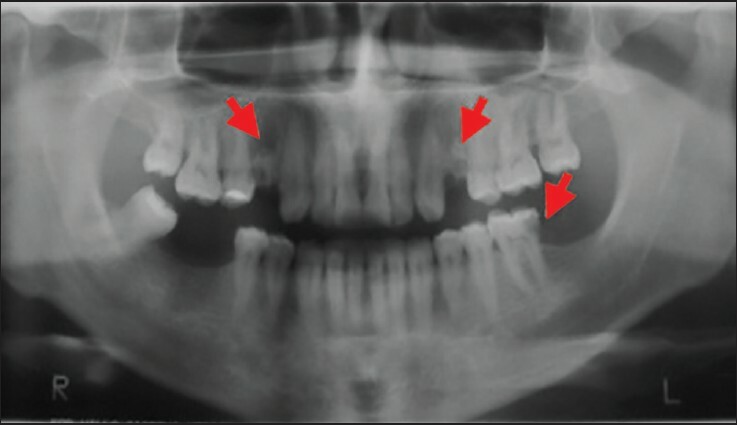 Hence, although radiography is an easy-access, routine diagnostic tool in dental clinical practice, and although the use of CT has improved image analysis, both techniques present limitations that have motivated dental practitioners to seek complementary resources for each specific case. With the aim of obtaining early data on endodontic periapical lesions (as early as possible in the course of the disease), Davidowicz et al. have compared diagnostic information on periapical abnormalities provided by scintigraphy and radiography. In that study, scintigraphy showed hot spots in areas considered to be normal on radiographs, but failed to locate the lesions precisely. In 2002, Faltin et al. created a device that allowed the exact location of a hot spot to be determined, thus overcoming this limitation of the scintigraphic method. Since then, scintigraphic mapping has become extremely important tool in the so-called dynamic diagnostic imaging field and endodontic diagnosis, especially in conditions such as postendodontic periapical lesions, ghost pain, fractures, early periapical reactions, among others. The present study was conducted to assess the diagnostic information provided by another state-of-the-art imaging technology, namely hybrid PET/CT, in the detection of metabolic abnormalities of the alveolar bone. In our study, the imaging agent 18 F-NaF was selected based on its high bone uptake, as previously described by Grant et al. and Laverick et al. Overall, the method provided reliable diagnostic information on periapical lesions. Some of the areas identified as hot spots on PET/CT in our sample were found not to be periradicular lesions. This occurred most frequently in patients presenting with sinusopathy or third molar eruption. These findings suggest that sinusopathies should be considered a contraindication for PET/CT, as also recommended by Davidowicz et al.,  Faltin et al. Shimamoto et al.,  and Laverick et al. Eruption processes detected with PET/CT imaging, in turn, should be confirmed radiographically to assess the phase of the eruption, as also recommended by Davidowicz et al. and Wild et al. Nevertheless, the visualization of these processes/conditions as hot spots on PET/CT is indeed a limitation of this method and underscores the need to carefully interpret the results of new, complementary technologies. In some cases where radiographs failed to detect the presence of mineralized tissue damage, the PET/CT method showed hot spots in the periapical region. 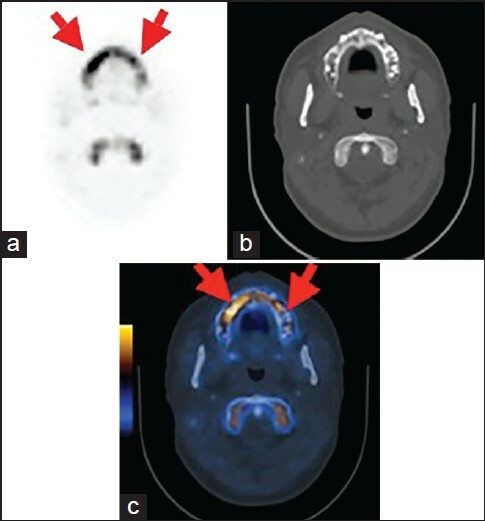 These PET/CT findings were confirmed at the subsequent clinical examination, which included pulp vitality and percussion tests to allow diagnosis of necrotic and/or inflammatory processes. Of the 256 teeth assessed, 17 were diagnosed with necrotic pulps after comparison of clinical, radiographic, and PET/CT findings and were referred for endodontic treatment. This decision was made based on the studies of Shimamoto et al., Laverick et al.,  and Wild et al. Five other teeth were extracted due to the impossibility of performing endodontic treatment. 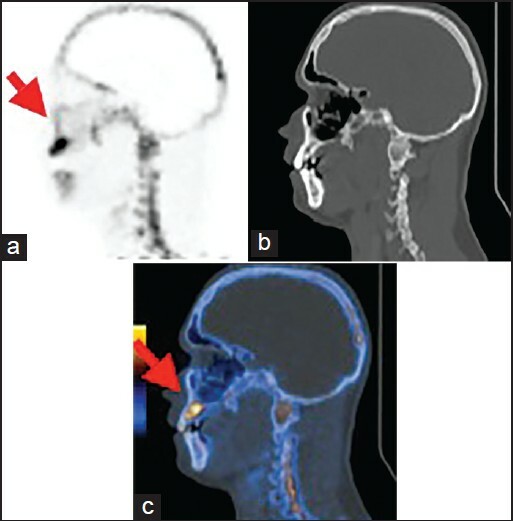 It's known that in spite of being a method that shows an early diagnosis, PET/CT present some limitations like the image artifact due to motion and dental filling. In addition, the cost of the exam is high when compared with a planar bone imaging, the radiation exposure is 68% greater when 18 F sodium fluoride (0.024 mSv/MBq) is used compared with 99m-Tc-methylene diphosphonate (0.0057 mSv/MBq), patients discomfort during injection and imaging due to the need to be motionless. Regarding to a practicality in the out-patient setting needs, it should be considered that those exams would be done in patients that will pass through immunosuppressive therapies, because those patients must not have any kind of infection in their organisms. According to Brenner et al. in the USA, the National Outpatient PET registry recently is gathering data on the right use of 18 F sodium fluoride, only to use it in tumor cases. It provides coverage with evidence development, with the goal of assessing the impact of the 18 F sodium fluoride PET on intended management, treatment intent, quality of life, and survival, comparing pre-PET intended management versus actual management after PET. In summary, this study is able to conclude that PET/CT is an effective alternative imaging method for use in dental clinical practice, capable of providing useful complementary information for the diagnosis of different conditions that cannot be adequately described using routine diagnostic tools. Radiography is undoubtedly an important clinical tool, and in fact radiography and PET/CT provide complementary diagnostic information. Further research is necessary to assess other potential contributions of PET/CT to the dental clinical practice, possibly leading to the consolidation of this method as a dental diagnostic tool. Bhuva B, Barnes JJ, Patel S. The use of limited cone beam computed tomography in the diagnosis and management of a case of perforating internal root resorption. Int Endod J 2011;44:777-86. Bender IB, Seltzer S. Roentgenographic and direct observation of experimental lesions in bone I. J Am Dent Assoc 1961;62:152-60. Jorge EG, Tanomaru-Filho M, Gonçalves M, Tanomaru JM. Detection of periapical lesion development by conventional radiography or computed tomography. Oral Surg Oral Med Oral Pathol Oral Radiol Endod 2008;106:e56-61. Tanomaru-Filho M, Jorge EG, Duarte MA, Gonçalves M, Guerreiro-Tanomaru JM. Comparative radiographic and histological analyses of periapical lesion development. Oral Surg Oral Med Oral Pathol Oral Radiol Endod 2009;107:442-7. Yim JH, Ryu DM, Lee BS, Kwon YD. Analysis of digitalized panorama and cone beam computed tomographic image distortion for the diagnosis of dental implant surgery. J Craniofac Surg 2011;22:669-73. Shimamoto H, Tatsumi M, Kakimoto N, Hamada S, Shimosegawa E, Murakami S, et al. (18)F-FDG accumulation in the oral cavity is associated with periodontal disease and apical periodontitis: An initial demonstration on PET/CT. Ann Nucl Med 2008;22:587-93. Ziessman HA, O'Malley JP, Thrall JH. Radiopharmaceuticals. In: Ziessman HA, O'Malley JP, Thrall JH, editors. Nuclear Medicine: The Requisites. 4 th ed. Philadelphia: Elsevier; 2014. p. 1-16. Liu RS, Chu LS, Yen SH, Chang CP, Chou KL, Wu LC, et al. Detection of anaerobic odontogenic infections by fluorine-18 fluoromisonidazole. Eur J Nucl Med 1996;23:1384-7. Tsai P, Torabinejad M, Rice D, Azevedo B. Accuracy of cone-beam computed tomography and periapical radiography in detecting small periapical lesions. J Endod 2012;38:965-70. Mahgerefteh SY, Sosna J, Bogot N, Shapira MY, Pappo O, Bloom AI. Radiologic imaging and intervention for gastrointestinal and hepatic complications of hematopoietic stem cell transplantation. Radiology 2011;258:660-71. Braz AK, Kyotoku BB, Gomes AS. In vitro tomographic image of human pulp-dentin complex: Optical coherence tomography and histology. J Endod 2009;35:1218-21. Fonse Ca DD, Kyotoku BB, Maia AM, Gomes AS. In vitro imaging of remaining dentin and pulp chamber by optical coherence tomography: Comparison between 850 and 1280 nm. J Biomed Opt 2009;14:024009. Davidowicz H, Lascala CA, Thom AF, Moura AA. Patients that had just done implant treatments comparing the areas in differents periods of the treatment with scintigraphy. Rev Assoc Bras Odontol Nac 1994;2:88-92. Faltin K Jr, Magalhães CB, Davidowicz H, Buchglel C. Assessment alveolar bone matabolian alter orthodontic treatment by skeletal scintigraphy. J Orofac Orthop 2002;34:181-6. Grant FD, Fahey FH, Packard AB, Davis RT, Alavi A, Treves ST. Skeletal PET with 18F-fluoride: Applying new technology to an old tracer. J Nucl Med 2008;49:68-78. Laverick S, Bounds G, Wong WL. 18 F-fluoride positron emission tomography for imaging condylar hyperplasia. Br J Oral Maxillofac Surg 2009;47:196-9. Wilde F, Steinhoff K, Frerich B, Schulz T, Winter K, Hemprich A, et al. Positron-emission tomography imaging in the diagnosis of bisphosphonate-related osteonecrosis of the jaw. Oral Surg Oral Med Oral Pathol Oral Radiol Endod 2009;107:412-9. Brenner AI, Koshy J, Morey J, Lin C, DiPoce J. The bone scan. Semin Nucl Med 2012;42:11-26.